The agrigenomics market is projected to reach USD 13.56 Billion by 2021, at a CAGR of 7.8% from 2016. The advancement in automated lab instruments is projected to influence the growth of the agrigenomics market. The research methodology used to estimate and forecast the agrigenomics market begins with capturing data on key players, their revenues, and testing prices on different sequencing platforms through secondary sources such as National Institutes of Health (NIH), National Human Genome Research Institute (NGHRI), and Beijing Genomics Institute (BGI). The overall market size was arrived after validating with primary interviews and secondary research. 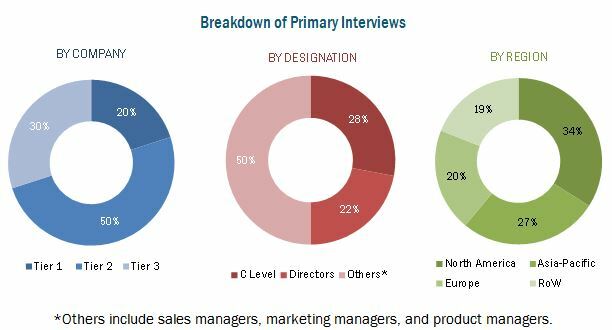 Then, a top-down procedure was employed to estimate the sizes of other individual segments and subsegments from the total market, which are then verified through primary research by conducting extensive interviews with key people such as CEOs, VPs, directors, and executives. Data triangulation and market breakdown procedures were employed to complete the overall market engineering process and arrive at the exact statistics for all segments and subsegments. The report studies about the interlinked supply chain operations between the upstream and downstream players. It has also covered upstream players such as technology providers and equipment & consumable manufacturers, such as Illumina Inc. (U.S.), Thermo Fisher Scientific, Inc. (U.S.), and Agilent Technologies Inc. (U.S.) due to their strong impact in the market growth of sequencing and genome analysis tools. The downstream players include agrigenomic service providers, biotechnology companies, and animal health companies such as LGC Limited (U.K.), Eurofins USA (U.S.), and Zoetis Services LLC. (U.S.). The agrigenomics market is projected to grow at a CAGR of 7.8% from 2016 to reach USD 13.56 Billion by 2021. The market has been driven by advancements in genomic technologies with various post-sequencing analysis techniques and strong government support in the developed countries. With many technologies at the disposal of agrigenomic researchers, genome sequencers are of immense value to make progress in carrying out further research objectives such as genotyping, parentage tests, and marker-assisted selection & breeding. In agricultural research, NGS (Next-generation Sequencing) technologies from Illumina, Inc. (U.S.) and Thermo Fisher Scientific, Inc. (U.S.) have been gaining strong demand to perform highly advanced agrigenomic research services to generate high data output and develop reliable analytical models. The need for environment-friendly & innovative production methods, advent of agricultural modernization, and better crop value have made the agricultural community identify new avenues such as agrigenomic technology. Agrigenomics is an effective method to maintain agricultural sustainability without affecting the environmental ecosystem. Advanced genomic research on livestock such as dairy cattle and sheep has been gaining momentum in developed markets to prevent genetic and pathogenic diseases in animals. 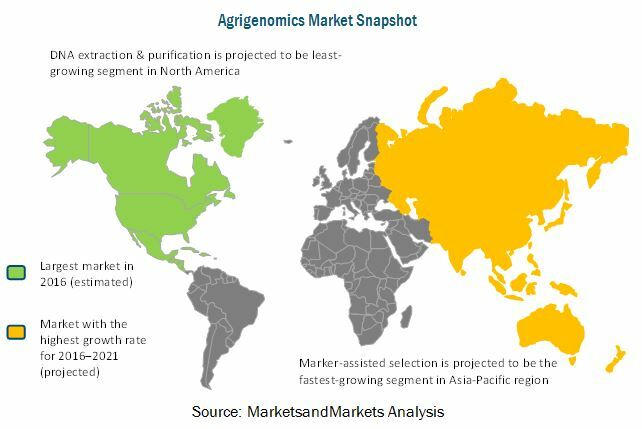 Genome analytic tools such as marker-assisted selection are expected to be a major solution for breeding projects for crops and livestock owing to which the segment is projected to witness strong growth in the next five years. Cross-breeding using agrigenomic technology is projected to be an effective method with the ban of GM technology on various crops and livestock in most of the countries. North American and European regions have been strong contenders in supporting research projects in agrigenomics. North America accounted for the largest market share in 2015, whereas the Asia-Pacific region is the fastest-growing market from 2016 to 2021. The North American region gained larger share due to the sophisticated technological research and development supported by the U.S. and Canadian government funds. Strong growth in the Asia-Pacific region has been attributed to the strong demand to improve crop and livestock productivity in China and Australia. Shortage of funds and limited adoption of automated instruments due to high investment requirements for advanced technologies have been restraining the growth of the agrigenomics market. With increasing government support, these problems can be averted by agrigenomic service providers. According to MarketsandMarkets, key players such as Thermo Fisher Scientific, Inc. (U.S.), Agilent Technologies, Inc. (U.S.), and Illumina, Inc. (U.S.) have been strengthening their range of analytical technologies through acquisitions to streamline their supply chain for agrigenomics services. Acquisitions were considered to be the most profitable strategy among key players in the last 5 years and it is estimated to bring about market consolidation at the global level. *Details on Overview' Products & Services' Strategies & Insights' Developments and MnM View Might Not Be Captured in Case of Unlisted Companies.